The director will receive the Sofia Award for his contribution to the art of cinema. Terry Gilliam is one of the uncompromising giants of cinema - individualist, an outstanding visionary, a member of the famous comedy group "Monty Python". He has created numerous fun, absurd and full of fantasy films, won two "BAFTA"awards, as well as four awards from the Venice Film Festival, has been nominated for "Oscar" and "Golden Globe" as well as many other prestigious film awards. For all who like "completely different" cinema, but also appreciate comic details caught from the world around us, Gilliam's films are always a real pleasure for the soul, mind and all senses! Sofia Film Fest will show special retrospective of Gilliam's work, starting on the 1st March at the Cinema House. The great master's visit and film screenings of the are realized jointly with the British Council on the occasion of the 20th anniversary of the festival and 25 years of mutual partnership! Terrence Vance Gilliam was born in Minnesota on 22 November 1940. When he was 12 years old, the family moved to Los Angeles, where Terry had a close encounter with the Hollywood reality. After high school Gilliam began studying physics, later graduated from Occidental college with a Bachelor of Arts degree in Political Science. After graduation he spent some time working in a magazine - he drew and dealt with the design of the publication. His story there ended as he joined the National Guard. The following years he was living on social benefits, touring Europe on a motorcycle, before the big meeting with the advertising business after he returned back to the States. During the political turmoil in the '60s, Terry Gilliam seriously feared that he could become a terrorist, so he decided to leave the United States. He went to Britain and with the help of John Cleese began working in children's TV show. It was work in television that later on introduced him to the other partners of the great "Monty Python" - Terry Jones, Eric Idle and Michael Palin, subsequently joined by Graham Chapman. The "Monty Python's Flying Circus" TV program turned the young men into the most popular comedians in the UK, while Gilliam was credited as an animator. He was responsible for the overall visual style of the comedy group TV appearances, and later co-directed and was drawing cartoons for their films. Terry Gilliam appeared also as an actor - one of his most popular roles was that of Cardinal Fang from the sketch about the Spanish Inquisition. At that time he met his future wife - Maggie Weston, who was Monty Python's makeup artist, and she subsequently worked for many of his films. The abundance of black humor and ruthless parodies of conventional values become the show's trademark. "There's a part of me that always had a crush on maniacal things, frantic animation performances. I always liked attractions, weird shows. Jerry Lewis was the weirdest show ... Absolute grotesque, horrible, tasteless. I like things to be tasteless, " comments Gilliam on his preferences. 1975 saw the "Monty Python and the Holy Grail" debut on the big screen. One of Gilliam's funniest movies and most characteristic for the comedy group until nowadays. In 1977 Gilliam made "Jabberwocky" by Lewis Carroll - a medieval fantasy with Michael Palin. Later Gilliam contributed to Python's films "Life of Brian" and "The Meaning of Life", but left Jones to direct on his own. In the 80s Gilliam filmed one of his most famous films - the picturesque tale of time travel thieves "Time Bandits" (1981), which became a hit in America; the scandalous "Brazil" (1985) - a symbol and image of the hopeless battle with almighty bureaucracy of a totalitarian state, the dreamy man-clerk and his flight to the dream for love and freedom. The film failed to reach good box office results, but instead it won loyal fans around the world because of its original script, great visual style and dark humor. This is the film that earned Gilliam's nickname of a "tough director." He did not give up and a few years later made another non-commercial hit - "The Adventures of Baron Munchausen" (1989) created with a stunning budget of 46 million dollars and a whole bunch of stars - Jonathan Pryce, Robin Williams, Sting, Uma Thurman, Oliver Reed. But then came the triumphant "The Fisher King" (1991) - his first commercial production to be accepted in Hollywood. The excellent performances of Jeff Bridges, Robin Williams, Amanda Plummer, and the "Oscar" winner -Mercedes Ruehl, the lack of complex special FX also helped the movie. The film was a box office hit and gained applause. Elated by the success, Gilliam developed another film project about a policeman who gets into the world of children's fantasies, but "Paramount" stopped his work because of financial problems. Five years passed before Gilliam returned with another successful product - the remarkable "12 Monkeys" (1995). The history of the world destroyed by a deadly virus is one of the cult films of the 90s, while Brad Pitt was nominated for "Oscar" for best supporting role. 1998 followed with the scandalous screen version of "Fear and Loathing in Las Vegas", a novel by Hunter S. Thompsons. Both Scorsese and Nicholson refused to work in the film. The premiere of the film was on May 16 1998 in Cannes. The critics did not hide their doubts about the director's further career after this film. The "hidden propaganda" of drugs was an object of discussion, but the most important part of the film were Johnny Depp's and Benicio Del Toro's unique incarnations of and the director's untamed imagination which helped him to film one of the most complex novels of the 20th century. After a 7-year break Gilliam presented "The Brothers Grimm" (2005), starring Matt Damon and Heath Ledger. Movie reviews were controversial but in the end it turned out that the producers intervened in the directing version of the film and caused some changes that remained in the version presented to the audience. The next project - "Tideland" (2006) was awarded with FIPRESCI at the International Film Festival in San Sebastian. 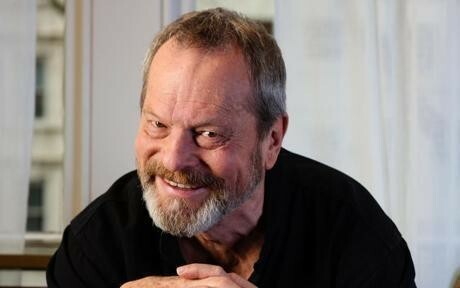 In the same year Terry Gilliam decided to drop his american citizenship. In 2007 Terry Gilliam started a project in collaboration with Charles Makkean - "Imaginarium of Doctor Parnassus" (completed in 2009), but stopped for some time due to actor Heath Ledger's sudden death. "While we were shooting "Imaginarium of Doctor Parnassus", we heard the news of the death of Heath, which ruined us, - Terry says in an interview. - We spent the whole day with Amy Gilliam and the chief operator Nicolas Pecorini lying on the floor. Heath was dead and we could not even get around to it..." Terry did not give up and finished the movie with three of the most famous actors, friends of himself and Ledger - Johnny Depp, Colin Farrell, and Jude Law. The result was magnetic and powerful, entirely in Gilliam's style! The last realized film of the famous film director is "Zero Theorem" (2013). The story is about a computer hacker named Quinn Let (Christopher Waltz), who lives as a hermit in his home in search of the mystery of human existence. The film, of course, is wrapped in the unique crazy visual style of Terry Gilliam, with his humor and the exclusive acting of Christoph Waltz, Matt Damon, Tilda Swinton, David Thewlis, Ben Whishaw and others. "The reason I do not watch so many movies is because I do not surprise myself anymore. I loved the movies because they opened doors to the worlds that I never imagined I would see. This happens very, very rarely now... Hollywood studios perceive people in America as a dumb audience. They try to lower the standards as much as possible in order to reach a wider and dull audience. I am continuing to oppose this and I want to believe in the viewers' intelligence. But if you keep feading the people with baby food long enough they will eventually begin to like it..." says Terry Gilliam.